For more than a decade now, relations between the Western powers and the Communist member states of the Soviet bloc have been characterized by the development of limited but important elements of cooperation along with the persistence of overriding conflict. 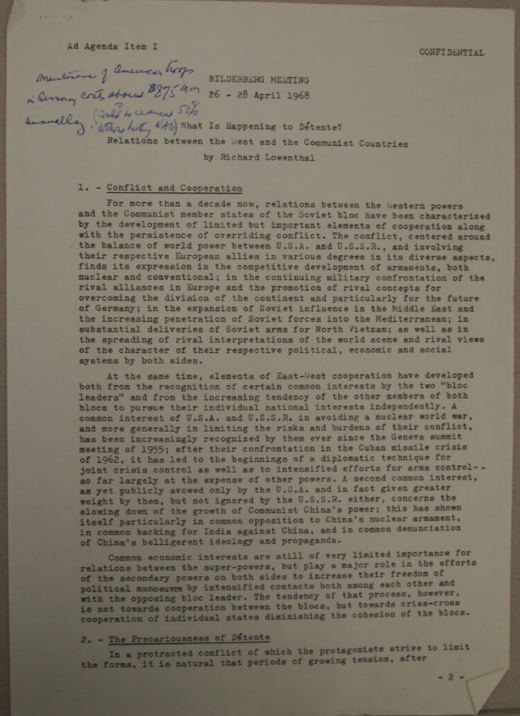 The conflict, centered around the balance of world power between U.S.A. and U.S.S.R., and involving their respective European allies degrees in its diverse aspects, finds its expression in the competitive development of armaments, both nuclear and conventional; in the continuing military confrontation of the rival alliances in Europe and the promotion of rival concepts for the division of the continent and particularly for the future of Germany; in the expansion or Soviet influence in the Middle East and the increasing penetration of Soviet forces into the Mediterranean; in substantial deliveries of Soviet arms for North Vietnam; as well as in the spreading of rival interpretations of the world scene and rival views of the character of their respective political, economic and social systems by both sides. as yet publicly avoided only by the U.S.A. and in fact given greater weight by them, but not ignored by the U.S.S.R. either, concerns the slowing don or the growth of Communist China’s power; this has shown itself particularly in common opposition to China’s nuclear armament, in common backing for India against China. and in common denunciation of China’s belligerent ideology and propaganda.